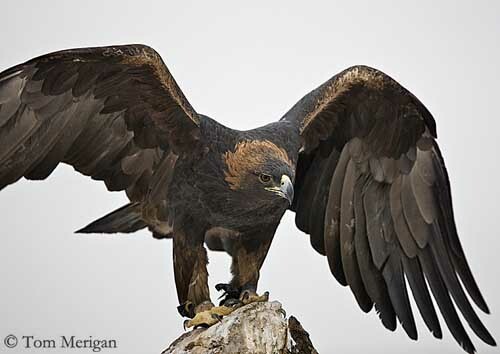 Golden Eagle is found in the Northern Hemisphere. This large raptor is often featured in national coats of arms of several countries, being famous by its powerful appearance and its bravery. This species is very appreciated in falconry where we can see its majestic flight. 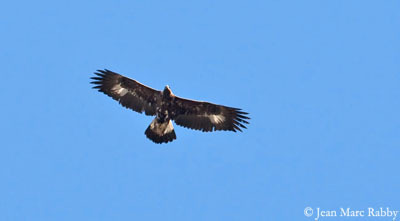 Golden Eagle adult has fairly uniform dark brown upperparts, except the paler crown, nape and median coverts which show pale fulvous-tipped feathers. Flight feathers are grey with darker inner webs. Tail has grey base barred brown and dark brown terminal band. Underparts are darker. On the underwing, small coverts are reddish-brown. Median coverts are darker. Great coverts are grey, as flight feathers. Wings are broad and rectangular, and tail is fairly long and broad with rounded tip. On the head, face, forehead and forecrown are dark brown, whereas hindcrown, nape and rear neck are golden-brown, extending to the neck sides. The strongly hooked bill is blue-grey to dark greyish, black-tipped, with yellow cere and gape. Eyes are yellowish to golden in adults. The long legs show brown feathered tarsi. Feet are yellow with strong, long and curved black claws. Female has similar plumage but she is larger than male. Juvenile is dark chocolate-brown with white bases to flight feathers. Tail has white base with dark brown terminal band. Eyes are darker than in adult. The young needs 4-5 years to reach the adult plumage, during which the white areas progressively turn brown. But the full adult plumage is reached at 6-8 years. 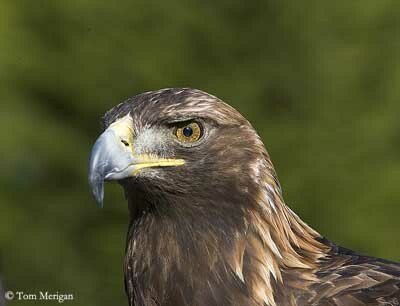 Golden Eagle has a lifespan of 20-35 years in wild, and up to 50 years in captivity. We can find six subspecies. They slightly differ in size and plumage, and extent of pale areas. Crown and nape, and mainly the rear part, range from yellowish to rufous-brown. Golden Eagle is usually silent, but during the flight displays, it may utter loud barks and mewing, also used as advertising calls. 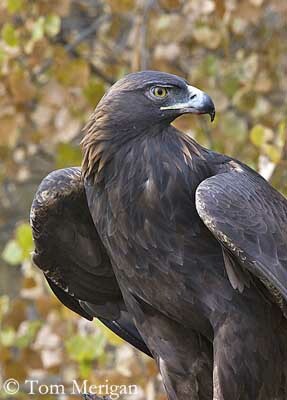 Golden Eagle frequents open and deserted areas, mountains, plateaux and steppes, and sometimes marshy areas. This large raptor avoids dense wooded areas, preferring low or sparse vegetation. It may be found from sea-level to high into mountains, and from desert areas to tundra’s edges. This species nests from sea-level up to high elevation, about 2000 metres in Alps and Pyrenees, but up to 5500 metres in Himalaya. The nesting-site requires peaceful places with rock faces or large trees, and high points on rocks or trees for perching. 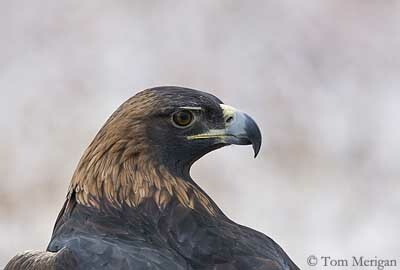 Golden Eagle occurs in Northern Hemisphere. This species breeds in Western Palaearctic, also in large part of Asia, eastwards to the Pacific Ocean. It is also found in North America, mainly in northern and western parts. It is the subspecies Aquila chrysaetos Canadensis. 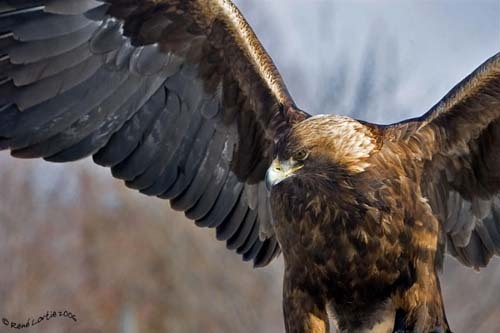 Golden Eagle feeds on medium-sized mammals such as rodents, rabbits and hares, birds such as gamebirds, less frequently reptiles, but it also takes carrion. It may hunt young and injured or vulnerable animals. 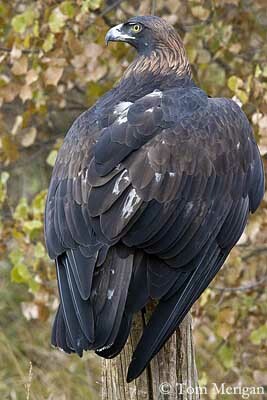 Golden Eagle often hunts from exposed perch. It flies relatively low over the treetops, watching for preys. Once the prey is detected, the eagle performs a short dive as well on the ground as in the air to catch it. Larger preys are pursued with hedgehopping flight before to be caught. Golden Eagles hunt in pairs. These large raptors are able to bring preys of 4-5 kg. The larger preys are torn up on the ground before to be carried to the nest. 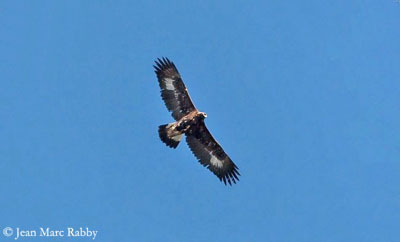 It may return several times to a very large carcass where only Golden eagles are feeding. The young wait and feed once the adult is gone. Sometimes, they harass it. 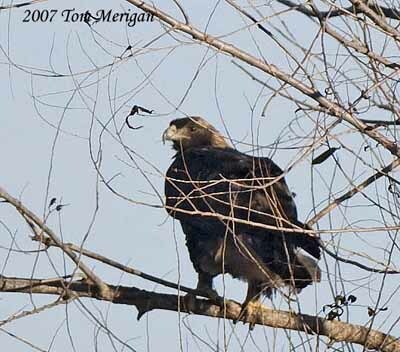 Large dead animals provide food to several eagles for fairly long period that is very important during winter. 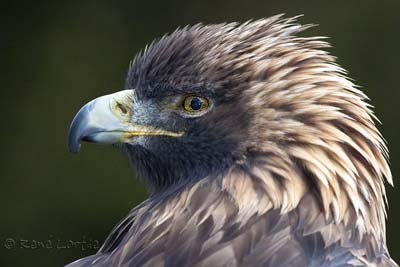 Golden eagle breeds at about 5-6 years of age. Pair-bonds last for the life. Feeding and hunting territories are occupied all year round, often by several generations of eagles, and are used in varied ways according to the season. Aerial displays are spectacular as in several raptors’ species. The first flight display is a dive by both mates. The lowest bird makes a turn while flying, with legs and talons held upwards, towards those of its or her mate. The second display is different. The bird descends and rises alternatively, performing undulating flight with several “waves” per sequence. Some chases are also performed by the mates. The same nest, or one of the nests, is used year after year. Each pair usually has several nests, 3 or 4, but sometimes more, up to 10-12. Golden Eagle is sedentary within the range. However, the populations of the northernmost parts of the range, both in New and Old World, are mainly migratory due to the non-availability of preys. The resident pairs remain in the same home range all year round. The juveniles are more dispersive. Golden Eagle flies with sweeping and powerful wing-beats. When it soars and circles, wings are slightly raised or almost horizontal. In direct glides, arms are raised but hands are horizontal. 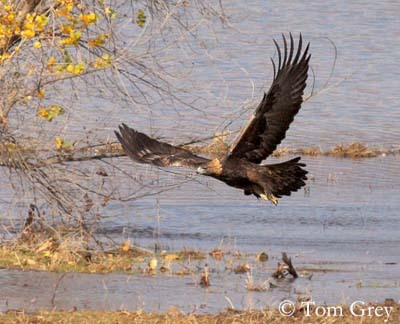 This large eagle performs spectacular flight displays. Breeding season starts in February in S Europe and S North America and until May in northernmost areas. 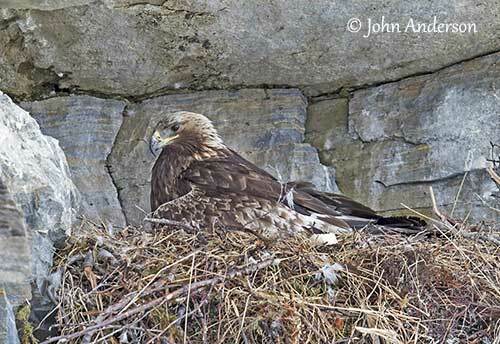 Golden Eagle nests in cliffs, on ledges and crags, but also in tall trees according to the range and the region. The nest is a large structure made with sticks and branches, and lined with green vegetation. The nest is huge, up to two metres wide and deep, because adults add new materials every year. Female usually lays two eggs at three days intervals. Incubation lasts about 41-45 days, mainly by female, but male may take part for more or less long periods. Chicks hatch asynchronously. They are covered in white down. The younger chick often dies, killed by the older sibling’s attacks. The chick is fed by both parents. The male brings the preys at nest where the female feeds and tends the young. It fledges between 65 and 80 days after hatching, but it still depends on adults for food for some months. Parents may tolerate the young eagle within the home range until the next breeding season. Breeding success depends on food availability and weather conditions. About 25% of the young reach maturity, due to starvation, collisions with powerlines, shooting and other causes. 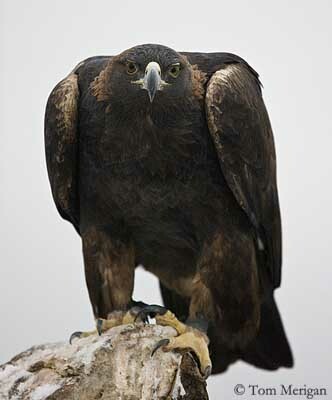 Golden Eagle feeds on medium-sized mammals, mainly rodents, rabbits, hares, foxes, cats, but also ground squirrels and marmots in mountainous areas. It also takes birds such as gamebirds including large grouses. Birds range in size from small passerines up to larger birds such as cranes, storks and swans. Some lizards and snakes, and sometimes tortoises are taken, mainly in S Europe. Carrion is important during winter. Carcasses of sheep or deer may provide food to several eagles. 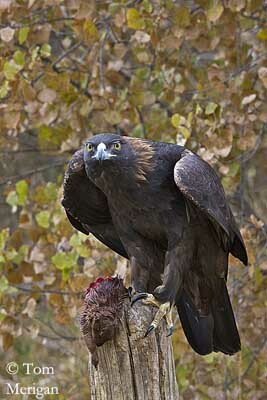 Young and injured or vulnerable animals are sometimes hunted by Golden Eagle. 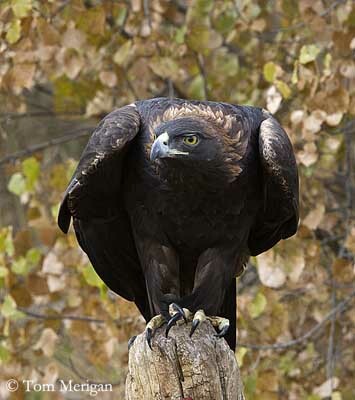 Golden Eagles were heavily persecuted in the past by shooting, poisoning and trapping. Declines followed in Europe and North America. Good protection and banning of poisons have involved some increases, or at least, stabilization of populations in several countries. Throughout most part of the range, causes of declines have been reduced by late 20th century. The limiting factors are now protection of suitable habitat and the food availability. However, the species is not threatened at this moment.